Reporter of NBC, Kacie McDonell is currently single after multiple failed relationships in her past but is happy being single. 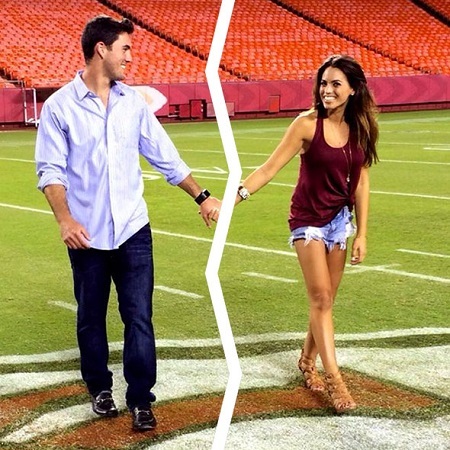 Kacie McDonnell; a reporter working for NESN has been in the news because of her relationships including the high profile engagement to Aaron Murray and her dating story with baseball player Eric Hosmer. dating someone? Who is her new boyfriend? If you are curious to know about all this then stay with us! Kacie McDonnell; Is She Dating anyone? Who Is Her Current Boyfriend? The gorgeous Kacie, these days, seems to be single and not dating anyone. After the few failed relationships look like the reporter is taking some time out from dating and is focusing on her career. She is currently working as a full-time anchor at NESN and is very serious about her work. But it also does not stop her from having fun as we can see her posts on her Instagram account; spending quality time with her friends and living the life to the fullest. Pasta coma with muh gurl. My purse is a landfill. A picture is only worth a thousand and I could write 17 trillion. You're my heartbeat! Happy birthday...I love you, @tybabyatkins !!????????????????? As of now, the girl is single and is busy working and we wish all the best for her future and also hope for her to soon find the love of her life. Aaron Murray who is an American football quarterback for Los Angeles Rams was in a relationship with Kacie in 2013. The couple was happy to have each other and after dating several months, they engaged in October 2014. The couple was about to get married soon and as per the rumors they were even looking for the venue for their marriage but out of a sudden, a news came relating their break up leaving all of us in a shock. Aaron and Kacie in her engagement day. They in the year 2015 called off their engagement with the mutual consideration and separated only after two weeks of Aaron's brother, Josh Murray split with his fiancé, Andi Dorfman. Kacie McDonnell; What about her Past Affairs? One of her first publically announced relationships was with Christain Ponder; an American football quarterback and currently is a free agent. Christian and Samantha with their child. 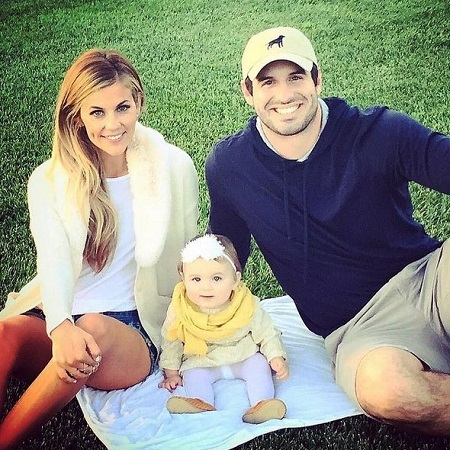 The relationship did not last long and separated only after few months, at present, he is married to Samantha Ponder and also has a child. Moreover, she again got linked along with Jonathan Pettibone, a Philadelphia Phillies pitcher in 2013. During their dating period, they were spotted together at Chase Utley's All-Star Animals Casino Night and also used to post several pictures together. 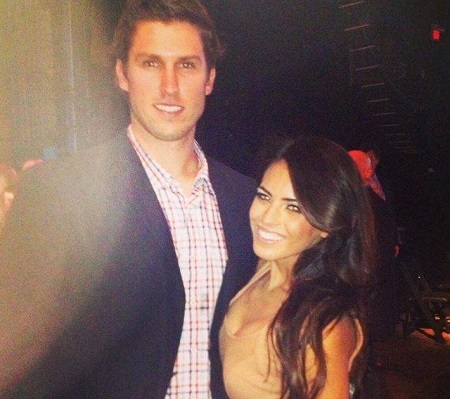 Kacie with her ex-boyfriend Jonathan Pettibone. Obviously, that relationship also did not last long and she began dating Eric Hosmer, an American professional baseball player. They were spotted in many places hanging out on dating, outings, and vacations as well. Despite such great relationship, they had to split up due to some unknown reasons. Kacie's Career; Where did it all began for her? Kacie began her career from QVC as an on-air model from 2009 to 2012. Working there for almost two years she shifted her job to FOX Television Network as an eagle pregame & sideline reporter and was there for not more than a year after which in the same network she shifted as a traffic reporter and producer. Also, See: Are CNN Reporter Nia-Malika Henderson and her Boyfriend Glenn Beck getting Married? Kacie continued shifting her job in the same network and again was shifted as a morning anchor where she used to anchor the show named, Good Day Philadelphia which aired in the morning from 7 AM to 10 AM. I got to go outside and play with the other kids today!!!!! Happy to see the stunner @guerinaustin...if even for 3 mins and 45 seconds. Take your kid to work day. Also wow 8 year difference is a lot. I look tired and annoyed and she looks bright-eyed and kind. Moreover, in 2014, she left the Fox and joined the Turner Sports and started working as a courtside reporter for 2016 NCAA Men's Final Four. Later on, she joined Sporting Kansas City and worked as a pre/post host and a sideline reporter. As of now, she is engaged with NESN and worked as an anchor since 2016. Born on 30th July 1990 in Pennsylvania, the United States. Her zodiac sign is Leo. Daughter of Michele and Ken McDonnell. Raised along with her siblings Isabelle and Lochlan McDonnell. Won the title of Miss Teen Pennsylvania International. Attended Nativity BVM High School. Graduated with a Bachelors degree in Communication and Specializations in Journalism & Media Production from the Villanova University. Started a career as an on-air model in QVC from 2009 to 2012. Currently, is working as an anchor at NESN in Boston.